Little Lulu was a comic strip created in 1935 by Marjorie Henderson Buell. The character, Lulu Moppet, debuted in The Saturday Evening Post on 23 February 1935 in a single panel, appearing as a flower girl at a wedding and mischievously strewing the aisle with banana peels. 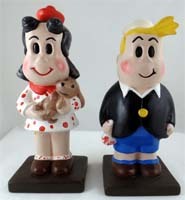 Little Lulu replaced Carl Anderson's Henry, which had been picked up for distribution by King Features Syndicate. The Little Lulu panel continued to run weekly in The Saturday Evening Post until 30 December 1944. The Saturday Evening Post asked Buell to create a successor to the magazine’s Henry, Carl Anderson’s stout, mute little boy, who was moving on to national syndication. The result was Little Lulu, the resourceful, equally silent (at first) little girl whose loopy curls were reminiscent of the artist’s own as a girl. Buell explained to a reporter, "I wanted a girl because a girl could get away with more fresh stunts that in a small boy would seem boorish". 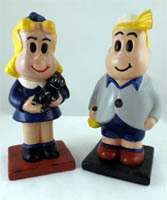 In 1951 Owens Illinois Glass Co. made glass tumblers with Little Lulu and here friends. Each one featured a different character on it with their pets.